← Democracy Requires a Patriotic Education: The Athenians knew it. Jefferson knew it. Somehow we have forgotten: Civic devotion, instilled at school, is essential to a good society. I am so glad that you enjoyed Lucca’s story enough to reblog it for your own readers. Thank you. 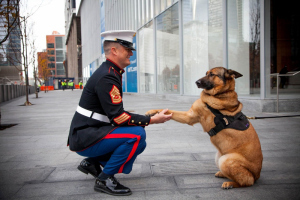 It’s always a pleasure to read about Canine heroes. Many do so much good. My favorite is the story of Chips on D-Day.